Today, mining companies, contractors and engineers have come to rely on the quick, effective method of pneumatically applied concrete known worldwide as shotcrete. It is a key component of many civil and mining projects. Smart contractors know that if shotcrete is applied correctly using the right equipment, additives and technical support, a solid foundation is built for a successful project. That is why it is so vital to work with a knowledgeable, experienced shotcrete partner. Our process-oriented approach includes working with the top people in the industry on project specification, mix design and material-handling logistics. Because every Shotcrete application is different, STI has the ability to “mix and match” your concrete delivery system from batch plants to pumps and auxiliary equipment. The Shot-Set 250 Liquid Accelerator is a liquid, non-caustic accelerator that has a proven track record. With dosages of 2% – 5% by the weight of cement, the Shot-Set 250 Liquid Accelerator lowers rebound to 10% or less – even overhead – and allows the nozzleman to place thicker layers.It provides extreme workability. When your shotcreting project calls for super adhesion and high “first-pass” thicknesses, ST-ALKALI FREE is the one. This homogenous liquid accelerator blends easily and completely. Shotcrete Technologies has developed a system for lining/repairing all types of culverts, pipes, shafts and tunnels that is quick, non-disruptive (i.e. no excavation), efficient and at a lower cost than conventional techniques. The system constructs a new permanent ‘in-situ’ lining using a cementitious mix that will develop a compressive strength of 6000 PSI or greater in seven days. The resulting lining will be more acid and abrasion resistant and more impermeable than ordinary concrete. Essentially, the process relines sections of a pipe or tunnel with a proprietary shotcrete mix using a ‘spinner’ nozzle that uniformly sprays the material onto the surface. A crew of three can do up to 500ft a day in normal circumstances. The diversity of projects today needs the very best combination of products, application, versatility, shotcreting experience and effective problem solving. 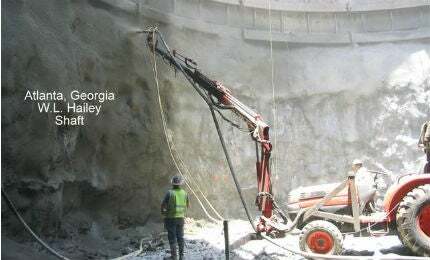 Shotcrete is dedicated to deliver this on every project, no matter how large or small. To find out how a partnership with us can help you build it right from the ground up, please contact us using the information below. Shotcrete Technologies, the right mix of products, know-how and service. Secretary of Commerce Penny Pritzker today presented Shotcrete Technologies, Inc. with the President's 'E' Award for Exports at a ceremony in Washington, DC. The 'E' Awards are the highest recognition any US entity may receive for making a significant contribution to the expansion of US exports. Conventional dry-mix shotcrete (where water is added at the nozzle) or wet-mix shotcrete (where air is added at the nozzle to pneumatically convey the material to the receiving surface) has long been used for lining horizontal pipes, culverts, and vertical shafts. Shotcrete Technologies will be exhibiting its latest products at the SME 2014 show, 23 to 26 February in Salt Lake City, Utah. Shotcrete has been supplying the mining and tunnel industry with efficient products and services for more than 30 years. US shotcrete project company Shotcrete Technologies has released an article highlighting the different technological applications for applying concrete to industrial projects surfaces such as horizontal pipes, vertical shafts and culverts. In July 2012, Shotcrete Technologies was contacted by Michigan Engineers of Mumbai, India to provide technical expertise, training and robotic shotcrete systems to rehabilitate portions of the aging storm water system in Mumbai with shotcrete.